Civil War: The Untold Story is a visually stunning and absorbing new 5 hr. documentary series that breaks new ground by examining the war through the lens of the Western Theater-battles in the lands between the Appalachians and Mississippi River. 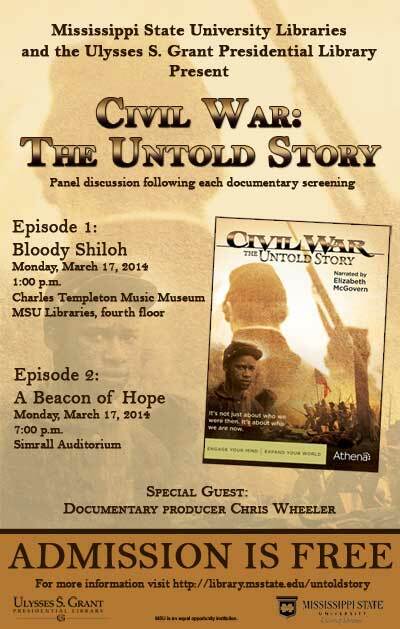 Civil War: The Untold Story is a visually stunning and absorbing new 5-hour documentary series that breaks new ground by examining the war through the lens of the Western Theater – battles in the strategic lands between the Appalachians and Mississippi River. Narrated by Elizabeth McGovern (Downton Abbey), the series is set to premiere nationally on public television stations beginning in April 2014. Rather than revisit the oft-told stories of the battles of Bull Run, Antietam and Gettysburg in the eastern states of Pennsylvania, Maryland and Virginia, this gripping and comprehensive new series instead tells the stories of Shiloh, Vicksburg, Chickamauga, Atlanta, and other battles in lands then known as "the West." Many historians believe that the Western Theater was where the war was won – and lost. In addition to the epic battles, Civil War: The Untold Story provides new insights into the relatively unknown roles African Americans played in the conflict – from enslaved to emancipated to soldier. Filmed in a sweeping cinematic style, Civil War: The Untold Story painstakingly recreates the battles of the Western Theater in a thoroughly authentic manner. Many scenes were filmed on the very grounds where these epic battles were fought, which add to the sheer magnitude of history felt throughout the films. The series also uses state-of-the-art 2D and 3D graphics, fascinating archival imagery, and incisive expert commentary by Civil War historians and scholars. Timed to coincide with the 150-year anniversary of the pivotal "Campaign for Atlanta," the series also chronicles the presidential campaign of 1864 in which Abraham Lincoln was nearly defeated. In many ways, Civil War: The Untold Story can be considered a prequel to Steven Spielberg's "Lincoln." Within the story of the Western Theater, the series highlights the causes of war, the home front, the politics of war, and the impact of war on Southern civilians and women. The authenticity of uniforms, voiceovers and scenery, makes it seemingly impossible to distinguish this modern adaptation from the actual war so many years ago.